A long tradition exists in the US for gentle parody of political leaders, yet over the past eight years satire aimed at the Bush administration has been strident, if not nasty. From the moment Bush was “selected” as president by the Supreme Court over the popular vote winner, Al Gore, the barbs targeted at Bush, Cheney and their Cabinet have been sardonic at best and vicious at worst (or actually the other way around depending on where you sit on the red/blue color spectrum), and have continued without let-up. Presidential humor has never been free from partisan prejudice, but during the brief Camelot era when JFK reigned (1960–63), satiric wit was respectfully meted out. Kennedy had his share of vehement detractors, but few were very funny. Political satire, which is normally designed to be harsh, was during the Kennedy era reduced to veritable love poems for the most popular president since the war. Even the various stand-up impersonators of JFK did not ridicule the man or the office. In fact, every comic with an ear for accents did Kennedy in endearing ways. The most hilarious of all parodies, The First Family album, managed not just to imitate his distinctive cadence but to smartly poke fun at Camelot’s quirks while eschewing the vitriol that informs Jon Stewart’s send-ups of Bush or, for that matter, the snarky Li’l Bush animated series on Comedy Central. Vaughn Meader, a mid-level stand-up comic from New York, developed an excellent Kennedy impersonation. His Boston/Harvard accent was pitch-perfect and even his look — hair, stance and gestures — was spot on. By 1962, Kennedy had become such an omnipresent figure that he was fair game as entertainment. 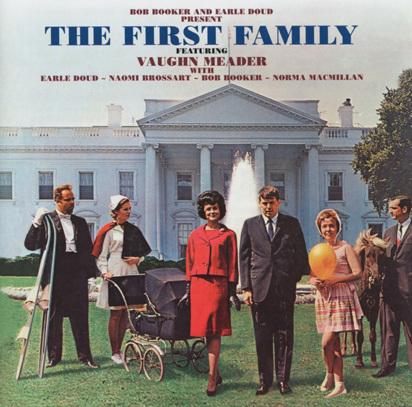 Meader struck gold with The First Family album (co-written with Bob Booker and Earle Doud), the fastest-selling record ever with 7.5 million copies sold. He also won a Grammy award and appeared on both The Ed Sullivan Show and The Tonight Show. The album’s unprecedented popularity boosted Cadence Records’ cash flow. While larger labels had refused to produce the album, Cadence speculated that the nation was ready. I was certainly ready. I was 12, a dedicated Kennedyite (at 10 I worked in his New York headquarters on 42nd Street, running the movie projector while playing an incessant loop of Frank Sinatra singing “Vote for Kennedy” to the tune of “High Hopes”) and a fanatical fan of the album. Meader was as big as the Beatles would become two years later and the album cover was every bit as iconic as Meet the Beatles, with Meader standing next to a flawless Jackie look-alike and other characters on the White House lawn. Of course, this was before Photoshop, and the image looked too real to be retouched, so I figured JFK had given his approval (what a guy!). The typography on the front was all scrunched together, but back then, what did I know about typography? The cover was flag, banner and billboard for a fabulous age. The side-splitting routines featured the talents of some of the best comedy writers and voice-actors of the day. One of them was Chuck McCann, known in New York for The Chuck McCann Show and Chuck McCann’s Laurel and Hardy Show, where he brilliantly impersonated Oliver Hardy. My favorite skit, titled “Economy Lunch,” involved a dining room meeting presided over by JFK and included, among other world leaders, Nationalist Chinese president Chiang Kai-shek, who when asked whether he wanted mayo on his sandwich replied: “Please, not to mention that name!” It’s stuck with me to this very day. Meader and Co. covered all the bases: rocking chairs, press conferences, Jackie’s renovations, children and Lyndon (who always played the fool). Kennedy’s assassination killed The First Family album and Meader’s career as well. No one would book the comedian who, almost as much as Lee Harvey Oswald, had come to symbolize the tragic end of Camelot. I didn’t throw my copy of the album in the trash like so many people did, but I never played it again after November 22nd, 1963.